A Good Source for Web Entrepreneurs: 11 Reasons - Why blogger is better than Word Press? There are so many reasons to start with a blogger.com but not with word press or any other blogging website for newbie, especially for those people who want to explore themselves in the Internet World I strongly Recommend Blogger blog for them. I know surely you will ask me why Blogger is better with any other blogging sites!! Here I want to share 11 reasons about why you need to skip the other blogging sites and stick to the Blogger. 1. Google’s Favorite Blogging Site. Yes! can surely say blogger is a favorite blogging site for Google, even I personally have some blogs in blogger site and few of them in word press, other blogging sites. But, I just shocked to see the results of my blogs in blogger. I got 80% more visitors flow in bloggers blog when compared with other blogs in words press etc. Even webelessons.com is also a blog which is created in Blogger. If you want to see your articles or posts in Google’s top pages, then go with blogger. 2. Integrated with Google Account & can link with Multiple Accounts. Simply, you can Login with Google to connect with blogger. Now a day’s Google providing the ability to connect with most of the services with one Account which includes the Blogger Account perhaps this is the major plus to start a blog with blogger. In other hands Google is also providing Ad sense (to Earn Money), Ad words (Pay per Click Service), Webmaster tools which can be easy linkup with Blogger from same Google Account. Blogger provided to handle a single blog with Multiple Accounts and also can shift from one account to another account. 1 Blog can be handled with multiple people with multiple accounts; this can be more flexible to handle multiple categories in New Postings, edit, or Alter Posts etc. 3. In Safest Hands of Google. Nobody want to put their work, or any loved things in non-trusted hands, in the same way choosing a good blog provider is very important than anything else. Blogger is safest place, because the backup is maintained by Google, as you already know Google is a largest ever company in the Internet World. Surely word press blog is also carries a better backup. As we see in history, the blogger is always being quick in updates of features such as widgets, addons, and templates etc., which is far better than word press. 4. Easy to Maintain – (I mean Less Technical). 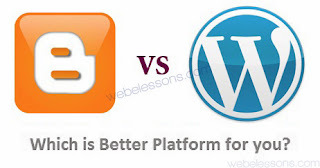 You need not to be a HTML or PHP Programmer to start a blog in Blogger. This can be a major relief for all Newbie’s. If a Doctor wants to start a blog, then surely he has to hire technical person to make it done. But, here blogger has done a great job by providing a Less Technical Blogging Platform. Here in the Blogger.com, no need to have a coding Knowledge. It has a simple editing Platform with great options to edit everything. Finally, anyone can maintain blog as equally as using a computer. Can easily Post, Edit and also can change template, theme, header, pages. Can add images, videos, maintain widgets, add revenue generating Banners (through adsense) in the page. Surely blogger is more flexibility than word press. Finally, it is also very suitable platform for non-technical persons. First of all you need to create one Google account through gmail.com and need to sign up with Blogger.com. Choose the name of your blog and click create blog. That’s it. This whole process will take around 5 to 10 minutes depending on your Internet Speed. Here if you compare with Word Press, the Blogger have no Hosting setup Issues, easy understandable setup process and you can install any of your liked theme or else you link up the other templates from btemplates.com where you will find 100’s free Templates, after that everything is ready to start posting articles. As you already a Gmail Account holder your details will be shown in your blog automatically. Hit Me "Like" if you liked the post. It Really Boost Us. Blogger has very secure and more effective spam control whereas word press is also have good plug-ins to linkup for spam control but, I got to know that it will be only effective when we got a premium versions of plug-ins. The blogger have inbuilt spam control, which will stop the spam comments which come automatically and also stops from regular comments posting system. In Blogger, the pretty cool thing is that, you won’t even see the spam comments, where as you need not to waste your valuable time to delete them. Simplicity always works, basically every visitor come for information, it is very important to make it webpage as easy as possible. Here I can say for sure blogger is the best option, where you can find bunch of great themes with simple layouts, neat navigated without getting lost of complex designs. This will be a huge advantage with blogger as it will allow visitors to stay for a long time & spend the time without getting confusion or frustration. If you want to download backup of your blog, the operation will be very flexible and easy in Blogger. You need not to work with boring code, just download and save the bunch of your blog in your desired format. That’s it. Comparatively Word press have little complicacy for doing this task. Whenever you create a post and publish it to the Blog, the Blogger interface itself will share it through Google+ to all your followers, the design itself; prompt you to share the new post with Google+ Followers which will help you the get high visitors. You need not to worry about doing it for every post, it is automated. If you don’t want to share your Post, you can easily stop this service through settings. After experiencing all major blogging sites, here I want to Thanks’ to blogger for having a highly secured data base. When comparing with word press, blogger have great security system which cannot be attacked easily. Here for word press the major drawback is in plug-ins, some of plug-ins looks like a great and genuine but after installing to your blog, some of the plug-in source may affect your blogs hugely. To be frank, I don’t want’ to show word press in the low and blogger in the high, but personally I faced some problems with word press, especially while starting my webelessons.com. Till now, I don’t face any problems with Blogger. Blogger.com itself integrates the word Blog; it has the highest blogging network in the world. Already millions of blog websites are successfully running in the internet world and daily thousands of new people adopting their blogging site through blogger. Comparatively Blogger is very popular than Word Press. The way Google has integrated the search system in the blog is amazing. Especially the random & next blog buttons are great to visit another blog. This system can increase the visitors to your blog and also have option to hide this service. Easily anyone can integrate facebook, twitter etc social icons to increase the network. I am sorry to word press fans, I have done my best analyze and tried to compare the two most popular blogging platforms, and can surely say the successful blogging is not at all lie on the platform which you choose but it lie on the way you work and maintain consistence at the work all the time. Me and Webelessons.com Wishes you all the best for your successful blogging. Please Note: I had been written to the best of my knowledge & experience. This article is written as per the technology exist at the moment of written time. Thanks a lot for reading and hope you learn something today. If you have any questions regarding this post please let me know. Adding your comment below really helps me to know where I am and or join a conversation. If you enjoyed this article and want to share. Please like webelessons.com in my facebook Page.